McCormick Mint Leaves have an aromatic, sweet flavor with a cool aftertaste. 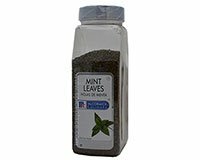 Mint Leaves are dried spearmint leaves of the species, Mentha spicata. Spearmint is the most widely used mint and is the preferred type for most dishes. Mint Leaves may be used in punches, tea, sauces for desserts, sauces for lamb, mint jelly, syrups, fruit compotes, fruit soups, split pea soup, devil's food cake, frostings, ice cream and sherbet, chocolate desserts, custards, candies, hot chocolate, vegetables, lamb stew, and lamb roast. They can also be used as a garnish. Mint is the classic seasoning for lamb dishes and also has an affinity for cucumbers and yogurt. Mint does not blend well with garlic. Product Ingredient Lists and Nutrition Facts, when provided, are for your convenience. We at Spice Place make every effort to insure accuracy of the ingredients listed. However, because manufacturers may change formulations, persons with food allergies should always check actual package label.